The Niagara Regional Police Service (NRPS) is appealing to the public to assist in locating a missing 20 year old male. Detectives from the 2 District- Niagara Falls office of the NRPS are trying to locate 20 year old Dani Joseph-Varghese. Joseph-Varghese resides in Niagara Falls. 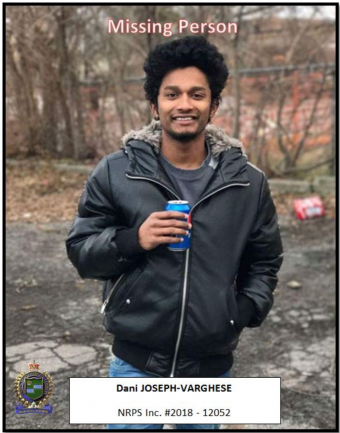 He was last seen in the early morning hours of Friday, February 9th 2018 in the area of Dufferin Islands on the Niagara Parkway in Niagara Falls. - Wearing a black leather jacket, black jeans, grey shoes and a grey Tommy Hilfiger sweater. The NRPS and the family of Joseph-Varghese are concerned for his welfare. Anyone with information as to his whereabouts is asked to contact the NRPS at 905-688-4111 ext. 2200.